Nothing says summer is over, and that we are moving into autumn more than sunflowers. The Native Americans used sunflowers in their end of summer festivals as they believed sunflowers symbolize bounty, the harvest season, and preparation for the coming winter months. Did you know that the sunflower will always grow facing the sun? That is how they got their name. Sunflowers symbolize happiness, joy, and sunshine! Why not capture these sentiments when giving someone a personal gift? 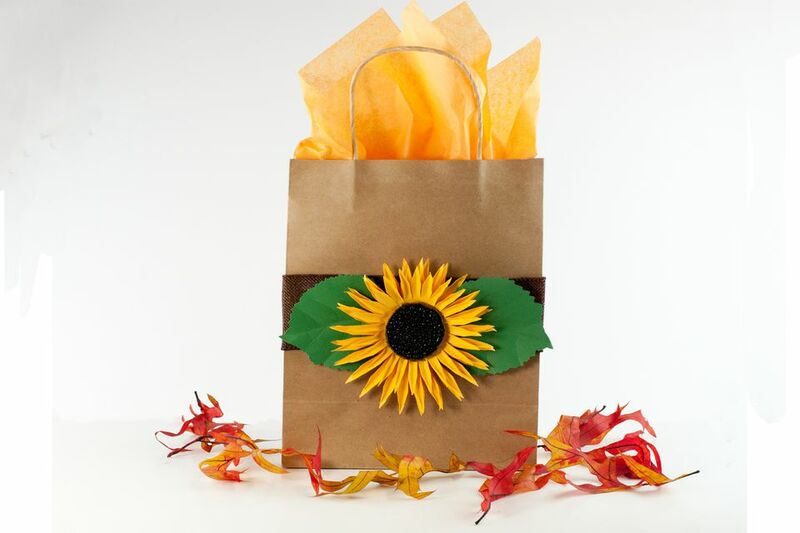 This sunflower gift bag is the perfect paper craft for portraying these feelings. Let someone know just how special they are to you and that they bring rays of sunshine into your life. This gift bag has a rustic design and an easygoing feel to it. It would make a perfect favor or gift bag for a simple wedding or bridal shower. You could also use it for birthdays and those gifts that you give just because! Cut the files on the appropriate colored cardstock with your digital die cutter. If you are cutting out the paper flower parts by hand, open the PDF file provided in the download and print the templates on the appropriate colored card stock. Cut the small, medium and large yellow sunflower petal portions of the paper sunflower from yellow cardstock with scissors. Cut the small paper sunflower center from dark brown cardstock by hand using scissors. !. The paper petal parts now need to have an added element of realism. 2. Add dimension and naturalness to the three yellow petal parts of the paper sunflower by crimping the petal edges upward with your fingers. Manipulate each petal to give it a natural look. Remember nothing in nature has a straight line so it is alright if the flower parts are not exactly symmetrical! Stack the three parts of the paper sunflower one on top of each other. The largest piece should be on the bottom; then the medium flower part should be on top of the biggest piece and then ending with the smallest paper flower template portion on top. Glue the layers together starting with the top center of the biggest piece and the bottom center of the middle piece together with tacky glue or hot glue.Use whatever type of glue you prefer in this step. Let the yellow sunflower petals glue dry before proceeding with the next step.Drying time should be about an hour if you are using tacky glue. If you are using a hot glue gun, everything should be securely attached after approximately five minutes. Crimp the edges of the brown cardstock sunflower center upwards with your fingers.The folded brown cardstock center becomes a container to hold the glass beads in the next steps. Spread tacky glue around the outer edge of the brown cardstock flower center as in the photo above.Leave the center of the brown cardstock flower center without tacky glue for now. Sprinkle the large glass seed beads onto the glue, then shake to remove excess seed beads.Make sure to have a solid layer of beads around the perimeter of the paper sunflowers cardstock center. Wait for about fifteen minutes to allow the glass beads to set. Apply tacky glue to the brown center and sprinkle the smaller sized glass beads on the middle portion. Shake off the excess glass beads.Make sure to completely cover the brown cardstock paper flower center with the smaller black glass seed beads. Allow the glass bead center to dry for at least three hours. Glue the brown glass bead center to the yellow paper sunflower with hot glue. Wrap the brown burlap ribbon around the open Kraft paper bag to determine the length of ribbon you will need. You want to have about .5 inch overlap. Cut the desired amount of brown burlap ribbon. Lay the ribbon flat on your work surface. Run a strip of glue with your glue runner onto the top and bottom edges of the brown ribbon. Start by placing the brown burlap ribbon at the center fold, continuing to place and press the brown ribbon around the center circumference of the paper bag ending once again in the center fold of the bag. Cut two leaves from green cardstock. You can either use a digital die cutter or cut them out by hand if you wish. If you are cutting the leaves by hand, print the pdf file on green cardstock and cut them out with scissors. Use a bone folder to score lines into the leaves as in the photo above. These lines will add realism and dimension to your paper leaves. Place the leaves and the sunflower onto the bag to determine the placement on the bag before gluing. After you are pleased with the arrangement, glue the leaves onto the brown ribbon with hot glue using the photo above as a guide. Glue the sunflower in between and on top of the green leaves with hot glue. That's it! You are now ready to place your gift in the bag. Make sure to top the bag off with some colored tissue paper that coordinates with the bag. Give the gift to your recipient and watch the happy smiles on their faces! Gotta love it!